Homemade Vegan Donuts or Doughnuts are eggless and dairy free dessert. Homemade Vegan Donuts are easy to make. Homemade Vegan Donuts are perfect for breakfast or a sweet treat. Homemade Vegan Donuts can be topped with a variety of delicious vegan glazes and frosting! They’re so delicious and they can be easily made without dairy and eggs. Who doesn’t like donuts? They are perfect as a dessert or a breakfast treat. So many people are moving to veganism nowadays and for these people finding egg free or dairy free dessert is very difficult here mostly in the USA. My husband’s friend is one of them, he doesn’t eat eggs and dairy products. One day he requested me to make vegan donuts for me as he knows I’m blogger and good cook (according to my family and friends 😉). So, made the Homemade Vegan Donuts recipe based on my previous Homemade Eggless Donuts recipe, but without any dairy products, finger crossed while making it and oh boy it comes out perfectly delicious!! Can’t believe these are eggless and dairy free too. Mission accomplished. 1. Take a bowl. Add slightly warm milk, sugar and mix well until dissolve completely. Add dry yeast, mix it, cover it and keep aside for 10 minutes until yeast becomes foamy. 2. Take another big bowl and shift the flour in it. Add salt, baking powder and mix well. Add melted butter, vanilla extract, yeast mixture and mix well. 3. Now make a slightly sticky, but soft dough, use water as required. 4. Dust the flour on the kitchen surface and turn the dough on it, then knead it for five minutes or until it becomes smooth and soft. 5. Apply a few drops of oil, then cover the dough into the big bowl for 30-35 minutes until double. 6. Once dough becomes double, punch it down, knead it again for two minutes, and divide into 2-3 portions of ball. Dust the flour and roll the ball into thick circle. 7. Now use a round cookie cutter or a sharp corner round glass and cut into small-small disks. Take a small cap/lid of a small bottle, press on the center of the disk and make the small hole. You will get exact shape of donut. Make a few donuts like that. 8. Place donuts on a tray. Apply little oil with a brush or spray. Cover the tray with plastic wrap and keep aside for 25-30 minutes or until it becomes double. 9. Heat oil in a deep pan/Kadhai, fry the donuts on a medium flame until golden brown, remove it on absorbent paper and keep aside. 10. If you don’t want to fry them, you can bake them 200 C or 450 F for 7-10 minutes until golden brown. 1. Take a small bowl for sugar glaze. Add powder sugar, melted butter, warm water, mix well and make a syrup. 2. Dip the fried donuts in the sugar syrup and coat all sides. 1. In a medium bowl, mix powdered sugar and oil/butter with a spoon or electric mixer on low speed. Stir in vanilla and one tablespoon milk. 2. Gradually beat in just enough remaining milk to make frosting smooth and spreadable. 3. If frosting is too thick, beat in more milk, a few drops at a time. 4. If frosting becomes too thin, beat in a small amount of powdered sugar. 5. Now divide it equally in three bowls. In one bowl, add blueberry juice, mix it well and make purple frosting. In another bowl, add cocoa powder and make chocolate frosting. In third bowl, keep it as is, a plain white. 6. 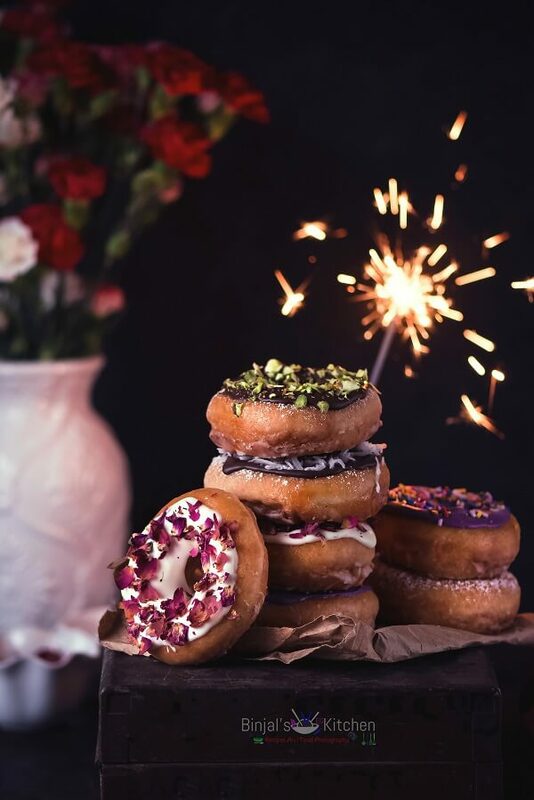 Now as per your choice spread the frosting on donuts, then sprinkle different kinds of toppings on it like coconut flakes, rose petals, Pistachios, or colorful sprinkles. 7. Once all done, keep it aside to set properly. Homemade Vegan Donuts or Doughnuts is ready, serve fresh and enjoy. • Use warm water, neither cold nor hot, otherwise it will kill the yeast and the dough won’t be doubled or foamy. • If you don’t want to fry donuts, you can bake them. • You can serve glazed donuts without frosting. • You can use different kinds of toppings as per your choice. Homemade Vegan Donuts or Doughnuts are eggless and dairy free dessert. Homemade Vegan Donuts are easy to make. Homemade Vegan Donuts are perfect for breakfast or a sweet treat. Homemade Vegan Donuts can be topped with a variety of delicious vegan glazes and frosting! They're so delicious and they can be easily made without dairy and eggs. Take a bowl. Add slightly warm milk, sugar and mix well until dissolve completely. Add dry yeast, mix it, cover it and keep aside for 10 minutes until yeast becomes foamy. Take another big bowl and shift the flour in it. Add salt, baking powder and mix well. Add melted butter, vanilla extract, yeast mixture and mix well. Now make a slightly sticky, but soft dough, use water as required. Dust the flour on the kitchen surface and turn the dough on it, then knead it for five minutes or until it becomes smooth and soft. Apply a few drops of oil, then cover the dough into the big bowl for 30-35 minutes until double. Once dough becomes double, punch it down, knead it again for two minutes, and divide into 2-3 portions of ball. Dust the flour and roll the ball into thick circle. Now use a round cookie cutter or a sharp corner round glass and cut into small-small disks. Take a small cap/lid of a small bottle, press on the center of the disk and make the small hole. You will get exact shape of donut. Make a few donuts like that. Place donuts on a tray. Apply little oil with a brush or spray. Cover the tray with plastic wrap and keep aside for 25-30 minutes or until it becomes double. Heat oil in a deep pan/Kadhai, fry the donuts on a medium flame until golden brown, remove it on absorbent paper and keep aside. If you don't want to fry them, you can bake them 200 C or 450 F for 7-10 minutes until golden brown. Take a small bowl for sugar glaze. Add powder sugar, melted butter, warm water, mix well and make a syrup. Dip the fried donuts in the sugar syrup and coat all sides. In a medium bowl, mix powdered sugar and oil/butter with a spoon or electric mixer on low speed. Stir in vanilla and one tablespoon milk. If frosting is too thick, beat in more milk, a few drops at a time. Now divide it equally in three bowls. In one bowl, add blueberry juice, mix it well and make purple frosting. In another bowl, add cocoa powder and make chocolate frosting. In third bowl, keep it as is, a plain white. Now as per your choice spread the frosting on donuts, then sprinkle different kinds of toppings on it like coconut flakes, rose petals, Pistachios, or colorful sprinkles. Once all done, keep it aside to set properly. Homemade Vegan Donuts or Doughnuts is ready, serve fresh and enjoy. • Use warm water, neither cold nor hot, otherwise it will kill the yeast and the dough won't be doubled or foamy. • If you don't want to fry donuts, you can bake them.